We have been studying matter for the past 2 weeks. It seems like A has always know that there are solids, liquids, and gasses, and has always been able to give examples of such, although I have no idea where she learned it. That happens so much with her. She just seems to "know" so much without ever being directly taught. 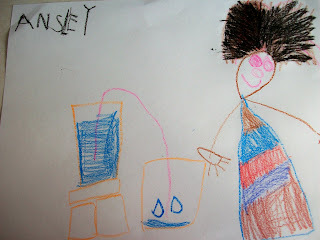 Anyway, we have been finishing up her first grade science books, and we introduced some new vocabulary such as "matter" and "mass" We did our unit on solids last week, and liquids this week, and next week we will be focusing on gasses. 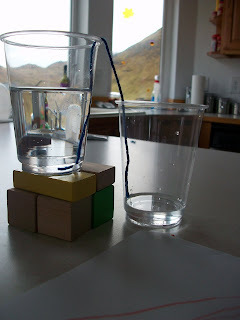 This week we did an experiment. Since we spoke of how water flows, and A loves the Magic School Bus book "At the Waterworks", thus she can tell you all about the water cycle, and pipes and how water gets to you. We made a string pipe. We talked about how the string was a solid. But not just a solid, a solid mixture as it is made up of many different threads that can be separated out and keep their own shape. But because the string is made of many threads, there are tiny holes between the fibers, this allows the water to escape like tiny openings in pipes. 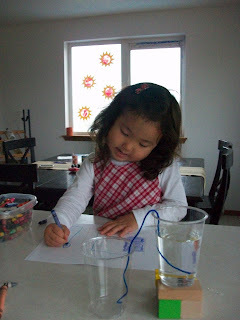 As we set up the experiment, she was able to correctly predict what would happen. That water would travel through the string, and out of the tiny holes thus filing the empty cup. I asked her if this would happen quickly or slowly, and she said "I think it will be slow and take quite a great deal of time because the holes are so tiny." 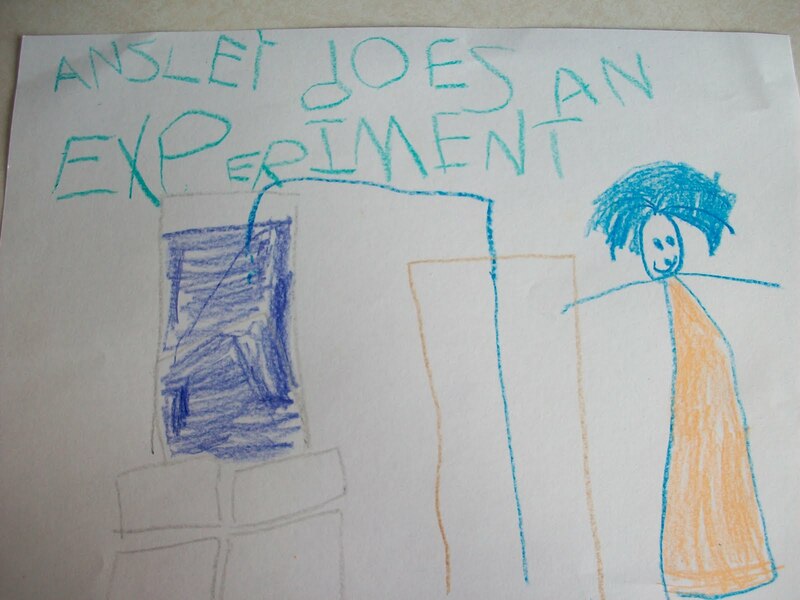 I asked her to draw the experiment as we set it up and then after it was completed she could draw her observations for her science journal. Here it is.....the finished product (I use that term lightly because it is actually still sitting in our kitchen with the empty cup now almost full. She wanted to leave it and see how long it took to empty the full cup and fill up the empty one.) So this is it after about an hour, at which point we made our observations and drew in our journal. 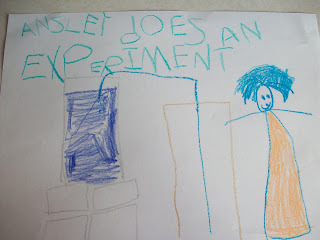 She asked for help spelling experiment, but did the rest on her own. She had to draw herself in both pics "observing" the experiment. This is her observation of what happened....and to quote her "This is me watching and how I would look if I had a bad hair day and did not brush my hair" LMAO. Got to love it. This is so cool! I have never seen this experiment done before. Love the pictures. Thank you for sharing. 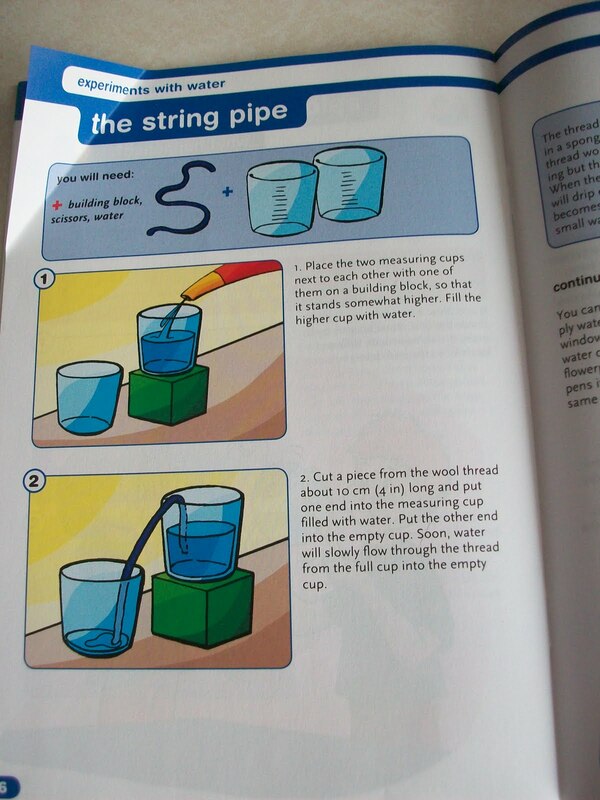 What science books are you using? I was going to ask the same thing about the science book you were using. I love the photo of her working and the wild hair picture is too hilarious!